This years Dublin Santa Dash is on Sunday 8th December at 11.00am. There are two distances available, 5k or 10k. Walker, runners and children are very welcome in both events and it should prove to be a real family fun day out. In addition to the usual festivities associated with the Dublin Santa dash, this year there is a ‘Real” Santa Grotto down on the beach where all the children can visit Santa. All children who officially take part in the race can visit Santa and receive a free Christmas present. For those children not taking part, a small fee of 5 euro is applicable. Of course many people who take part in the Dublin Santa Dash have their own ideas for raising money for charity and printing the sponsor forms is part of that formality. We think, because of this, it’s likely that ink shops will see an increase in the sales of ink cartridges in Dublin. Hopefully, those taking part will opt for the compatible version of the printer cartridges in Dublin in an effort to keep the cost down! The location of the Dublin Santa Dash is Clontarf in Dublin and the run will take place on North Bull Island starting at 11am. There are two entry fees, Adult €25 and child €20. A Santa suit is included in the fee. All entrants are required to collect their Santa Suits and Goody Bags on the day before the race at the race Expo between 12pm – 6pm. For those people travelling from outside Dublin, Santa suits can be collected on the morning of the race between 9am and 10.45am. As part of your entry, you can take advantage of a 10% discount on all running gear at the Expo. 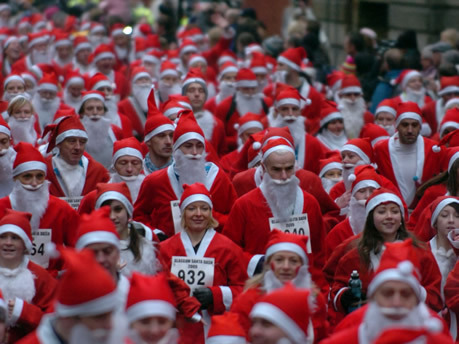 We wish everyone the very best of luck with the race and their run for a good ‘Claus’. Visit Santadash.ie for further details.